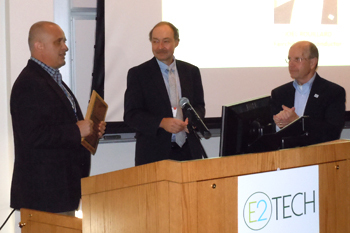 E2Tech honored outgoing Treasurer Joel Rouillard and outgoing Co-Chairs Jeff Thaler and Jim Atwell for their service to our organization at the Annual Meeting on Nov. 15. Thank you to our speakers for this forum. Presentations by Tim Soley, Jim Atwell and Maggie Connolly are linked to their names, below. For more information on SMCC's Sustainability Center, Building Science certificate program and related professional development programs visit their website. Maine employers will share their success stories for environmental and energy innovations at the Annual Membersip Meeting of the Environmental & Energy Technology Council of Maine (E2Tech). Maine's environmental and energy leaders will provide examples and case studies whereby they have designed, installed, supported, or constructed innovative, transferable technologies that improve the bottom line or reduce their environmental or energy footprints.